How Safe is the 2019 Mazda CX-9? How Big is the 2019 Mazda3 Hatchback’s Cargo Space? The i-ACTIV AWD® system is Mazda’s new-generation, fully autonomous all-wheel-drive technology. This i-ACTIV AWD® system helps in harsh driving conditions such as a snowstorm in Wilson or traveling in rainy weather. The best part is you don’t have to sacrifice the excellent fuel economy ratings Mazda is known for to achieve greater traction and wheel grip. Learn more about this new Mazda technology as well as which new Mazda models provide it at Medlin Mazda. While you’re on the road, i-ACTIV AWD® is constantly tracking road conditions and small changes in wheel speeds. Using sensors, road conditions and more are tracked and taken into account. i-ACTIV AWD® interprets the information from the sensors and can make adjustments to the amount of torque allocated to the front and rear axles. The Front-Wheel Slip-Warning Detection System also uses a variety of sensors to monitor ground speed and front-wheel speed, allowing the system to sense tiny wheel slips that could lead to tire spin. Torque Control System works closely with Front-Wheel Slip-Warning and i-ACTIV AWD®. Even in FWD mode, it almost instantaneously transfers a small amount of torque to the rear wheels and helps your vehicle switch to AWD without lag. Explore Mazda AWD Cars at Medlin Mazda! 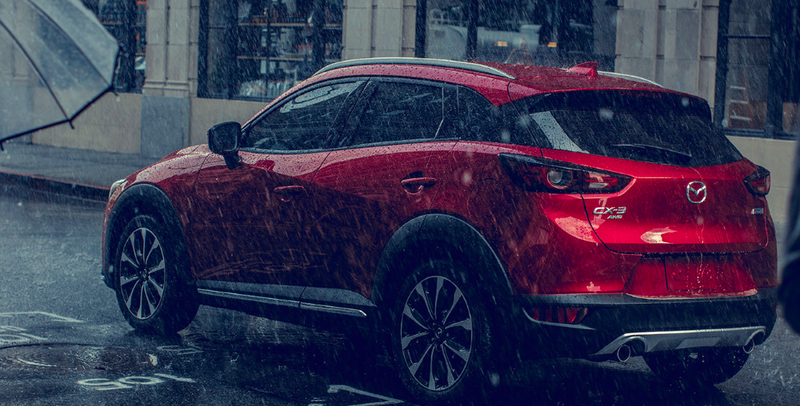 Once you’ve found the AWD Mazda model you want for cruising through town, schedule a test drive with one of the Mazda SUVs to experience the power and precision of i-ACTIV AWD®! While you’re here, in order to save more, be sure to browse our new vehicle specials on models like the Mazda CX-5 and Mazda CX-9. Contact us in the meantime with any questions about this system or our models! Does the 2019 Mazda3 Sedan Have All-Wheel Drive? What Safety Features are Available in the 2019 Mazda CX-3? How Safe is the 2019 Mazda CX-5?